“The Manchester United Church entered into a contract with O’Brien Stained Glass Company for three large and complete leaded glass windows and complete leaded glass windows and a fourth partial one. The total project had a cost of approximately $30,000. Sandi O’Brien’s design was complimentary to the architechural style of our building. It also accomplished the desired moderating of the sun’s light while adding to the worship atmosphere of our sanctuary. Kevin O’Brien assembled and completed the installation of the windows within the contracted time. His workmanship was excellent down to the smallest detail. He always left the worksite in a clean and orderly fashion. We wholeheartedly recommend this company to anyone considering the addition of stained glass windows to their facility. 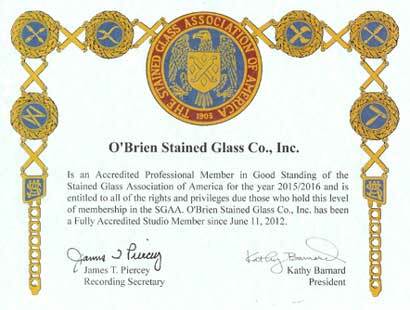 “We gladly recommend O’Brien Stained Glass Co., Inc. to any church committee considering the purchase of new stained glass windows. We compared several stained glass company’s and found their prices very reasonable and affordable. The artist was very cooperative and sensitive to our needs. We looked at and reworked many designs until we arrived at the design most suitable for our church. Our committee felt that the O’Brien’s did more than we expected in working with us, communicating with us, and providing photographs of the project. The contract was carried out in a timely manner. The congregation was pleasantly surprised that the windows were installed exactly when they were promised. The committee that worked on this project said they enjoyed this project more than any committee they had ever been on in the church. We had a full church for the dedication and everyone, including the donors of the memorials which paid for these windows, was very pleased with the windows. If any church is considering stained glass windows please call me and I will be happy to talk about our experience with O’Brien Stained Glass Co.